Oh Scott Lang, you could not be more wrong. But it’s ok, the ride turns out awesome anyway. 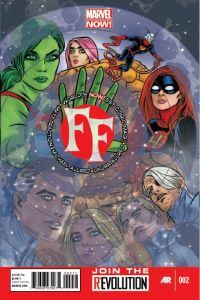 FF#2 picks up right after the second issue of Matt Fraction’s other tie-in, Fantastic Four, as Marvel’s First Family begin their trip to the unknown universes. Events make a turn for the worse back on Earth, as Scott Lang and the Future Foundation learn that the new Fantastic Four’s stint will be a lot longer than expected. Fortunately for us, it makes for a fun story. Fraction’s biggest strength in his other acclaimed series Hawkeye, the dialogue, carries over into FF. From Scott’s slight horror when he realises that the Fantastic Four aren’t coming back, to She-Hulk lamenting the loss of her Stella McCartney outfit; each of the character interactions are brilliantly handled. Without spoiling anything, if you aren’t laughing at a few of the excellent lines in this book, you need to check your pulse. Dana Deering’s transformation to Ms Thing also comes to a head within this issue, and while the marketing seems to be building her up to act a bit like a bimbo, she often comes across as less like a an airhead, and more of an ordinary person thrown into extraordinary events. While it seems that Fraction is trying to make her likeable, she doesn’t come across as even remotely annoying – just a bit naive. Once again the art pairing of Mike Allred and wife Laura looks as great as ever. There is a particularly stunning moment when the Mole Man and his beast appear to take on the Future Foundation, which shows that the Allreds know a thing or two on how to create fantastic looking monsters. The series so far harkens back to old Silver-Age comics, and is a treat to read. One other problem that plagues this issue is that it almost requires you to read the Fantastic Four as well, as the events pick up immediately after the second issue of that series. Hopefully that is something that will change in the coming issues, with the Fantastic Four embarking on their journey, but readers of only the FF series will have a harder time following what is going on. Despite issues regarding extra reading, FF again continues to impress, both in story and in visuals. If Fraction and the Allred’s can keep this momentum going, while allowing FF to stand on its own, this book will be one to watch in the coming months.